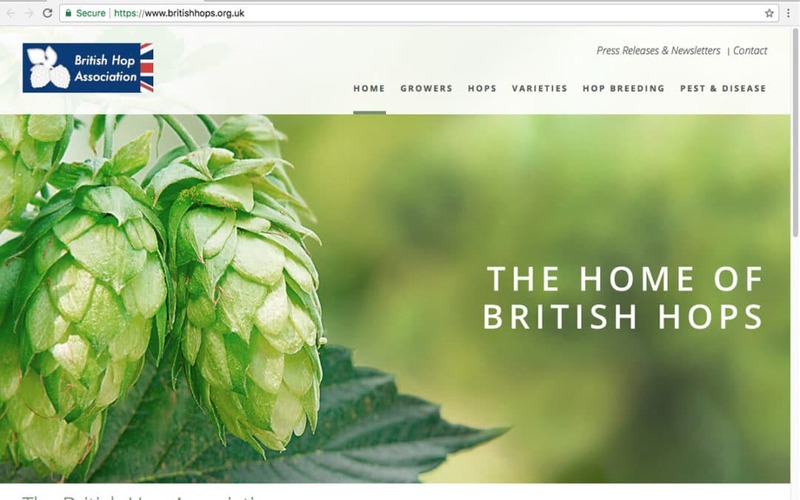 The British Hop Association is delighted to announce the relaunch of its website – www.britishhops.org.uk – with a fresh new look and some interesting insights from industry professionals. Since its initial launch in 2012, the British Hop Association website has welcomed an ever-increasing amount of traffic not only from brewers all over the world but from potential growers, beer enthusiasts, the media and anyone with an interest in hop farming. This new website has an updated layout, information on the new varieties and includes British hop testimonials from respected industry individuals as well as photographs, presentations and press information. Damian McConn, Head Brewer of Summit Brewing Co in St Paul, Minnesota, USA, comments ‘Pilgrim is an excellent dual-purpose hop used in a range of ales at Summit Brewing Company, including our flagship Extra Pale Ale which just received another gold medal at the great American Beer Festival. Its clean bitterness, balanced flavour profile and unique aroma qualities of currants, gooseberries and cedar blend particularly well with caramel and roasted malts found in pale ales, porters and export stouts.’ Other varieties are lauded by brewers for their flavour, aroma and the individual quality that they bring to certain beers. The 2017 season is looking good so far with the harvest of some of the earlier varieties, Goldings and Phoenix, beginning towards the end of August. Starting with a cold winter, an early spring and high temperatures earlier in the summer combined with good rainfall, the naturally pessimistic hop farmer could allow himself to think that he might have an excellent or even ‘bumper’ crop this year. However, this can’t be confirmed until later in the autumn when the hops are in the bale. Confidence in the British hop industry is also demonstrated by an increase in overall hop acreage which has gone up by another 4% this year from 942 hectares last year to 980 hectares this year. It demonstrates that British hop growers are optimistic about the market going forward and reflects the positivity of the industry over the last few years. The British Hop Association was formed by British hop growers in 1996 to ensure that the hop industry was properly represented in the UK and that it had a co-ordinated approach to its activities especially in research and development through its subsidiary, Wye Hops Ltd. In 1998, there were 13 commercially grown British hop varieties, today there are 31. Given that it can take 10 years to develop a new hop variety, that is quite an achievement! As well as being highly innovative, the UK is also the only country to have focused strongly on disease resistance making British hops environmentally friendly and inevitably, more appealing. With an increase in acreage of hop growing in the UK and a continued increase in craft beer production, the future of hop production in the UK is looking bright.